A container filled with millions of Lego pieces fell into the sea off Cornwall in 1997. But instead of remaining at the bottom of the ocean, they are still washing up on Cornish beaches today - offering an insight into the mysterious world of oceans and tides. "Let me see if I can find a cutlass," says Tracey Williams, poking around some large rocks on Perran Sands with a stick. She doesn't manage that, but does spot a gleaming white, pristine daisy on the beach in Perranporth, Cornwall. The flower looks good for its age, seeing as it is 17 years old. It is one of 353,264 plastic daisies dropped into the sea on 13 February 1997, when the container ship Tokio Express was hit by a wave described by its captain as a "once in a 100-year phenomenon", tilting the ship 60 degrees one way, then 40 degrees back. As a result, 62 containers were lost overboard about 20 miles off Land's End - and one of them was filled with nearly 4.8m pieces of Lego, bound for New York. No-one knows exactly what happened next, or even what was in the other 61 containers, but shortly after that some of those Lego pieces began washing up in both the north and south coasts of Cornwall. They're still coming in today. A quirk of fate meant many of the Lego items were nautical-themed, so locals and tourists alike started finding miniature cutlasses, flippers, spear guns, seagrass and scuba gear as well as dragons and the daisies. "There's stories of kids in the late 1990s having buckets of dragons on the beach, selling them," says Tracey, who lives in Newquay. "These days the holy grail is an octopus or a dragon. I only know of three octopuses being found, and one was by me, in a cave in Challaborough, Devon. It's quite competitive. If you heard that your neighbour had found a green dragon, you'd want to go out and find one yourself." She says the ship's manifest - a detailed list of everything in the containers - shows a whole range of Lego items, not all sea-themed. After all this time "it's the same old things that keep coming in with the tide", particularly after a bad storm. Tracey runs a Facebook page which documents the Lego discoveries, and recently received an email from someone in Melbourne who found a flipper which they think could be from the Tokio Express spillage. US oceanographer Curtis Ebbesmeyer has tracked the story of the Lego since it was spilled. "The mystery is where they've ended up. After 17 years they've only been definitely reported off the coast of Cornwall," he says. It takes three years for sea debris to cross the Atlantic ocean, from Land's End to Florida. Undoubtedly some Lego has crossed and it's most likely some has gone around the world. But there isn't any proof that it has arrived as yet. "I go to beachcombing events in Florida and they show me Lego - but it's the wrong kind. It's all local stuff kids have left behind." Since 1997, those pieces could have drifted 62,000 miles, he says. It's 24,000 miles around the equator, meaning they could be on any beach on earth. Theoretically, the pieces of Lego could keep going around the ocean for centuries. "The most profound lesson I've learned from the Lego story is that things that go to the bottom of the sea don't always stay there," Ebbesmeyer adds. The incident is a perfect example of how even when inside a steel container, sunken items don't stay sunken. They can be carried around the world, seemingly randomly, but subject to the planet's currents and tides. "Tracking currents is like tracking ghosts - you can't see them. You can only see where flotsam started and where it ended up." But there's also a dark side to the story, he says. If Lego is on land then it's fun. If it's on the ocean it's deadly, a poison for birds. 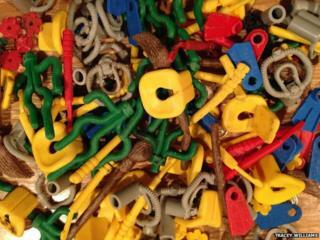 If you lose one container with 5m pieces of Lego in it, that is a catastrophe for wildlife. Lego spokeswoman Emma Owen says the Tokio Express incident "was of course very unfortunate, however this had nothing to do with the Lego Group activities". "We share an overall concern for the environment and we are very focused in our environmental efforts at our production sites to eliminate the waste that potentially could become a marine litter problem." Elsewhere in Cornwall, Martin Dorey of Bude is all too aware of the Lego being washed up. He runs the 2 Minute Beach Clean group which encourages people to pick up litter on beaches, and gets in touch with companies whose produce ends up on the shoreline as a result of this kind of accident. "I know it's not their fault, it's the way the ships are stacked," he says. "But while container spills are all resolved from the insurance point of view, it's not resolved from the marine point of view." The 2 Minute Beach Clean group has a Twitter hashtag and an Instagram page, which Dorey says allows litter pickers "to see that their work is adding to the work of others". Claire Wallerstein runs the Rame Peninsula Beach Care group, which cleans up beaches in south-east Cornwall. The group has collected more than 1,000 sacks of beach debris since it began its monthly collections in March last year, and one recent intensive clean up led to 576,664 pieces of plastic being recovered from a cove (including 42 pieces of Lego). "The Lego isn't a one-off thing - it happens all the time. There's a certain type of cigarette lighter that's from a container spill more than 20 years ago which is still washing up on Cornish beaches today. "If you look at the washed-up Lego, it looks perfect, like it's just come out of the box. Plastic in the sea is not going to just decompose and go away." It's not just children who like to build towers with Lego - the internet is alive with discussion on how many Lego bricks, stacked one on top of the other, it would take to destroy the bottom brick. So what's the answer? Chris Koch, the president of the World Shipping Council, says there is an "array" of legislation in force regarding the construction of containers - each one costing £2,927 ($5,000, 3,671 euros) - and how they are stacked aboard container ships. "The predominant cause of loss is very, very bad weather, when the forces of nature overcome the forces of lashing the containers to the ship. The industry does what it can, but it can't control Mother Nature." Back on Perran Sands, Tracey continues to pick up debris thrown up by the tides on each of her daily beach walks. "It's a never-ending job. Sea debris, and plastic, doesn't go away. It's filling up the sea and our beaches. "Very often you find a lot of Lego when you're bending down with a litter-picker. It's like a reward for picking up the rubbish."